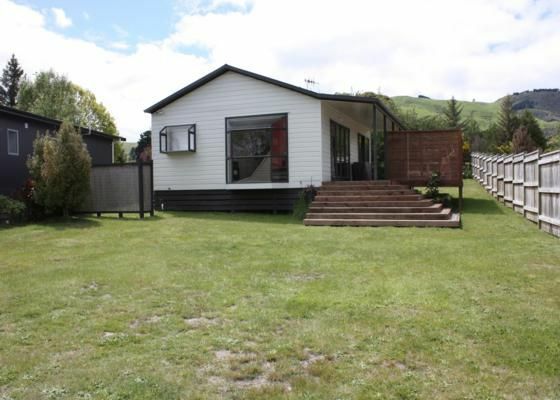 Our tidy two bedroom home is situated backing onto the Kinloch 10 hole Golf Course. Enjoy a glass of wine on our secluded deck in the evening. Just a short drive up the road will take you to the Jack Nicklaus International Golf Course. Bring your boat and launch it in our Marina and spend a day fishing or water skiing. If you are into mountain biking, we have two world class mountain bike tracks to choose from, or you could just walk them. We have three cafes and two restaurants to choose from, as well a tennis courts and a safe swimming beach. There a several children play areas, including the domain with play equiptment. The property itself was nicely set-up, clean, comfortable and in a good location in Kinloch (short drive to the Marina, lake and shop and cafe). We enjoyed our stay and would like to have stayed another day. Worked well for a short overnight stay for two couples. Was a nice and tidy property. Great little bach in beautiful Kinloch. Great little bach in beautiful Kinloch. Very clean, tidy and modern. The private deck is great to sit on and enjoy the sun. Very quite location. Good access with the boat was a real plus. Very nicely presented.